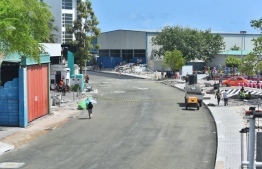 Tarring of capital Male's ring road 'Boduthakurufaanu Magu', which connects to the Sinamale Bridge being developed between Male and airport island Hulhule, has commenced. Minister of Housing and Infrastructure Dr. Mohamed Muizzu confirmed the work in a tweet. In the tweet, he had also thanked the public for supporting the ring road project. The minister expressed his appreciation for the public's understanding, since the stretch of the road being tarred has been closed for months, making it difficult to navigate around the area. Along with tarring, major changes have been made to the road, such as expanding it to 16 metres with four lanes. According to the housing ministry, this is to control the traffic changes that would occur once the bridge is open. The ministry has plans to tar the ring road, from the Hulhumale ferry terminal up to the Industrial Village. Apart from Boduthakurufaanu Magu, several other roads will be further developed to accommodate the Male-Hulhule bridge that is set to open in August.